Establishing herself in the competitive world of bridal design, this Spanish designer knows how to fuse haute couture with street style and create delightfully modern wedding dresses. One of the biggest challenges for wedding dress designers is bringing your own distinctive style to the iconic white dress without losing the essence of the bride. Inspired from street fashion and the latest haute couture trends, Inmaculada García style is a fusion of elements, in which the modern bride is well represented. This year, the designer wanted to bring some significant changes to her collection, saying ‘we have to break with the catwalks and bring fashion back to the buyer!’ The 2016 Bridal Collection “Golden Sunshine” abandons stuffy layers and puts the spotlight on the delicacy and purity of materials, presenting a more refined and elegant bride. We can see the influence of California, the Golden State, in the collection – the golden touches like the sunlight reflecting in the morning off the Pacific or the sunset catching the glass windows of the city. The collection surprises us with wedding dresses that convey on one hand a more demure look and on the other a bold modernism in a perfect blend of classicism and sensuality. For the more sensual line in her new collection, Inmaculada García deliberately chose lightweight fabrics like organza and tulle so that she could play with big bold shapes, but also weighed the fabrics down with pearls and jewel applications. The other line is night to the day of the romantic wedding dresses, and offers more structured, elegant options, embellished with pleated silks, chantilly, damask fabrics and transparent features. 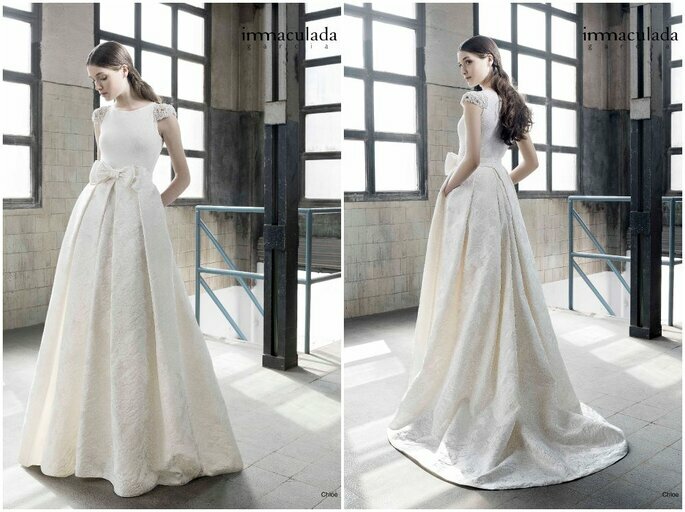 “I have always chosen innovative designs for wedding dresses,” says the designer. Her passion for fashion blossomed at an early age and in 1995 Inmaculada García opened her own boutique, after a few years the designer really started focusing on bridal designs when her customers continued to ask her to design custom wedding dresses. It´s this experience in fashion and custom design that makes the designer´s eponymous label both wearable and unique. Inmaculada García opened her flagship store in Barcelona in 2007 and has been setting the standard for artisanal production ever since. Teamwork is essential for the brand, including the bride who will ultimately wear the wedding dress – the team thinks of what that modern bride will want from the first to the final stages of wedding dress design.